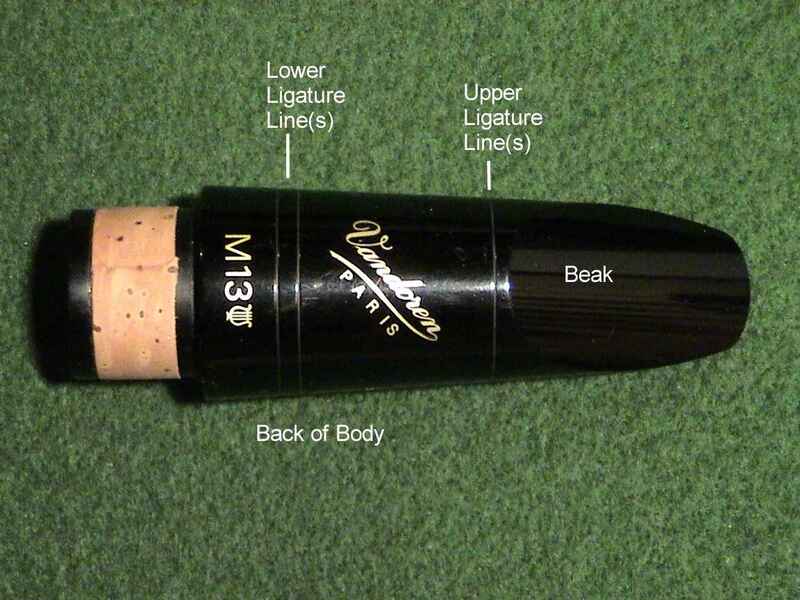 Tip Rail – the Tip Rail is at the very tip of the mouthpiece. It is curved, the approximate same shape as the tip of a reed. Side Rails – The Side Rails are designed as a curve from the table to the tip rail. Side rails are best when they represent a nice smooth arc. Playing and response problems can occur when these rails are uneven to each other or do not represent a nice smooth arc. 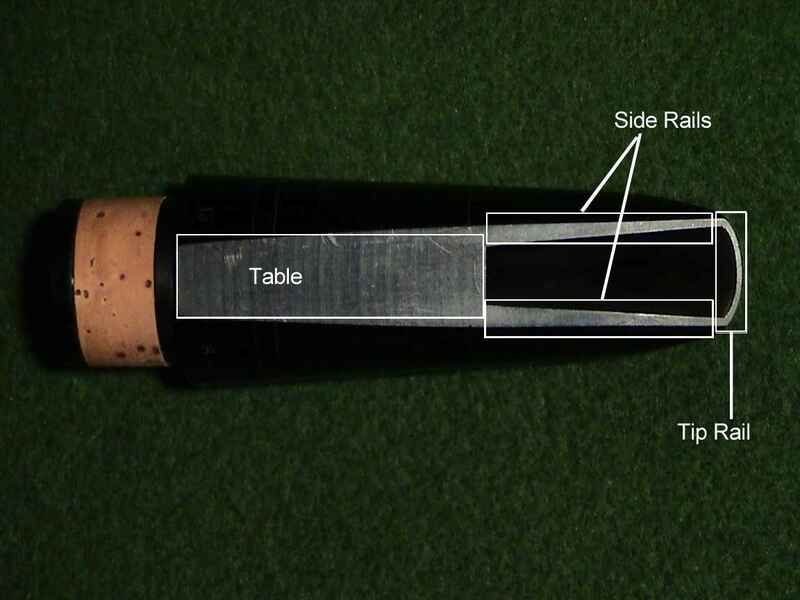 Table – The table is the flat part that the reed is placed on. Table that are perfectly flat are preferred. Table with concave sections can also be preferred but one must not over tighten a ligature as this will create issues with the reed curving away from the rails. Window – the opening between the Table, Rails and Tip Rails. A longer, narrower window creates and even, balanced resistance. There are various shapes dependent upon design intent. Ligature Lines – Identified as the optimal place to put a ligature by lines on the Body. Place the ligature in between these lines. Toothpatch – a rubber patch that is placed on the top of the beak. This allows a comfort for the teeth and protects the beak. Facing Curve – This is the side rails as they curve away from the table. They can vary per the overall length dependent upon the design of the mouthpiece. The more the curve the larger the tip opening. 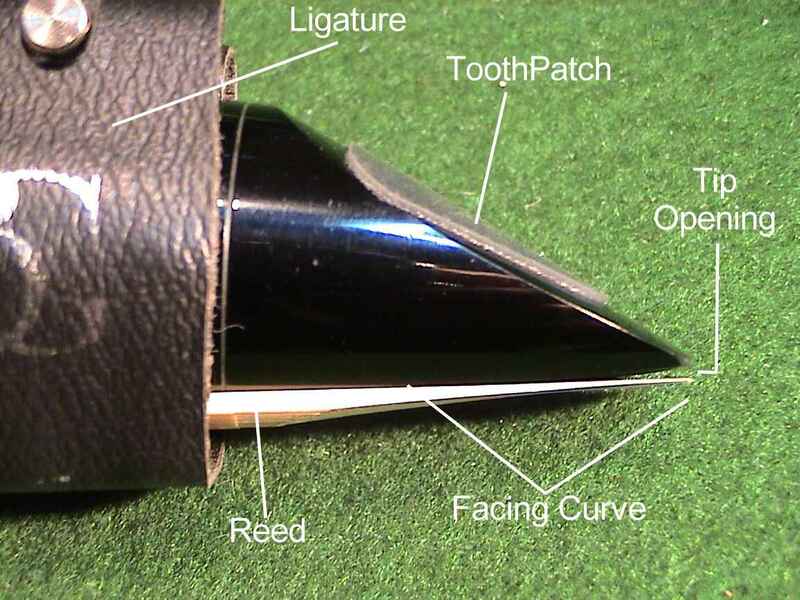 Over time a player’s reeds may bend and make the tip opening smaller than what it was designed for (the reason to always take the reed off of the mouthpiece and place on a flat glass or reed holder). This is also the case of the player’s embouchure is too close to the tip of the mouthpiece – they will essentially close down the tip opening more than normal.